An English manor is a manor house and surrounding fortification with the characteristics of cultural and historical England, separated by these English characteristics from other types of manor houses in various European countries such as Wales, Scotland, Ireland and Northern Ireland and the Channel Islands. Usually, an English manor refers to a fortified country house that served as the center of administration for a manor, which was a territorial diversification in the European feudal system. Most English manors were owned by the gentry class. In their earliest versions, English manors were fortified to protect against attack, but later these fortifications became more a show of wealth than for any practical purpose. In England, a fortified home was seen as a mark of favor, as only feudal lords who were in the good graces of the king were allowed to have what was defined as a manor. All other gentry class individuals were required to build unfortified housing, although that housing could still be quite large. English manors were used to house "feudal lords" as opposed to simply rich men and families who could afford them. It was not until the relatively stable Tudor period in England that the English manor became an unfortified housing establishment, with Henry VIII taking many of the monasteries from the ecclesiastical ownership and bestowing them upon laymen that were in his favor. The lords that were given these houses then converted them into private country homes, or English manors. 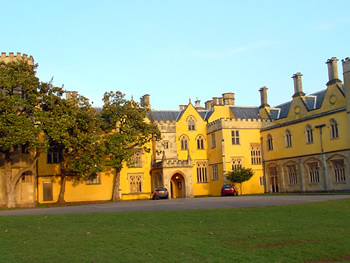 This period saw the building of famous English manors such as Forde Abbey and Wobum Abbey. The architectural design that today populates the general notion of what an English manor is did not come about until the reign of Elizabeth I and James I, her successor. These mansions were designed specifically for the gentry, and were not converted from monasteries as were the previous forms of English manors. As such, they were given different suffixes to differentiate them from the converted monasteries. They were known as "houses" or "palaces," also as "court," "hall," "park," "place," "tower," and "mansion." Some of the most famous of these later renditions of the English manor are Alford Manor House, Cothay Manor, Icomb Place, Ashton Court, Avebury Manor, Duns Tew, Ascott-under-Wychwood Manor, and Kirby Muxloe Castle. Copyright © English-Manor.com. All Rights Reserved.